I was actually eating a piece of cake (chocolate, yum!) while reading your post! So maybe we can share cake :) Love the pic of the icebergs - that is something we definitely never see in Australia! I used to read a lot of fantasy when I was a teenager but I stopped when I couldn't figure out what to read next. Back then, my favourites were Anne McCaffrey and Raymond E Feist. I am very impressed with your FMQ skills, and I agree wholeheartedly about asking for help. If you ask, people will help. Nice to meet you and happy birthday. I wish we all could share some cake. What a beautiful part of the world you live in. I love your log cabin quilt. My log cabin was a long term project just finished it earlier this year. Thank you! It is beautiful here. We love camping around the province so we can explore more of it. 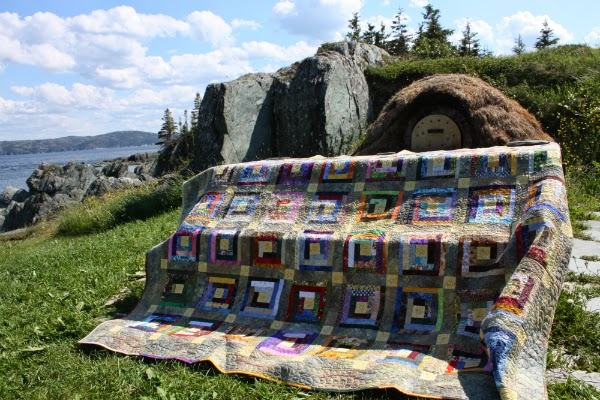 Glad to hear I'm not the only one who took a long time with a log cabin quilt! Happy birthday! I'm singing happy birthday to you in my head (much better for everyone that way). :) I have really enjoyed getting to know you through the blog hop. I know what you mean about realizing that you don't have to always follow someone else's directions. That moment of realization was pretty amazing. love love love your log cabin quilt, it is awesome. I'm still in the follow someone else's direction, but I'm happy doing that. Happy Birthday Leanne! Hope you had a lovely day. It's very nice to meet you and I'm thankful that you've done an introductory post, it's great to read more about you and what inspires your quilting. Happy Birthday! Nice reading more about you! I just finished the latest George R.R. Martin book in the series. Now I can't wait for the next one (although I won't read his teasers!). Lovely quilts! I'm sure it's late by now but 'Happy Birthday!!'. 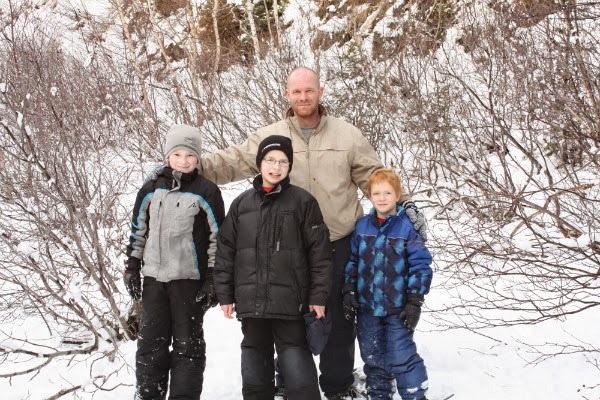 I love the photo of your hubby and the boys. They look like they've had a really fun time. Happy Birthday! I loved seeing the picture of your family. I have been married 14 years and have three boys. :) I can't wait to see more pictures of your scrappy log cabin. Happy Birthday Leanne! I love that you have three boys too! Being a fellow Canadian, I can sympathize with a short growing season! Your quits are lovely! 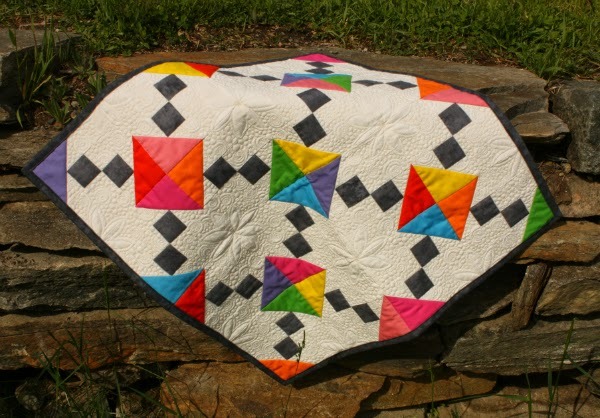 I love the quilting on you mini quilt! I'm an avid reader too- I have enjoyed Alan Bradley's novels (and he's a Canadian too!). Happy birthday! And you're so right that you don't have to do things the way you've always done them, though sometimes those habits are hard to break. I have a Nathan too :). Happy Birthday! I'm doing a hexie project, too, but much smaller than yours :D I plan to turn it to a bag. Will look forward to see your finished hexie. HI there, fellow blog hop post! Wow! Your mom didn't take it easy on you with that first quilt. It sounds like a doozy! 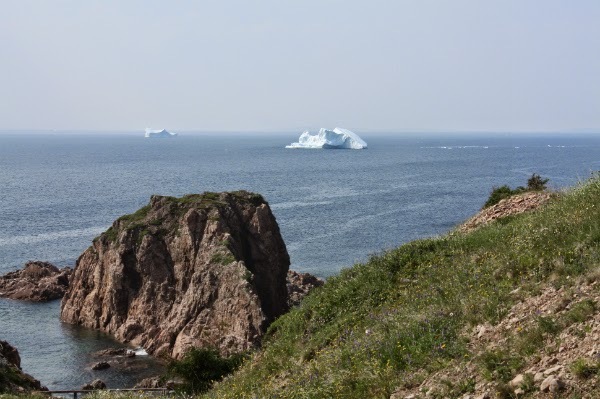 It's nice to find another Nova Scotian blogging around out there. Your EPP quilt is amazing - I've yet to make anything bigger than a pillow or a table runner! I love your mini quilt! The quilting you did on it looks gorgeous. I like your hexie project, I've just started one and have a feeling it will be a work in progress for many years to come! Nice to meet you, and Happy Birthday! I would love to share a slice of birthday cake, I love cake. Hope you had a Happy Birthday! Love your log cabin quilt. 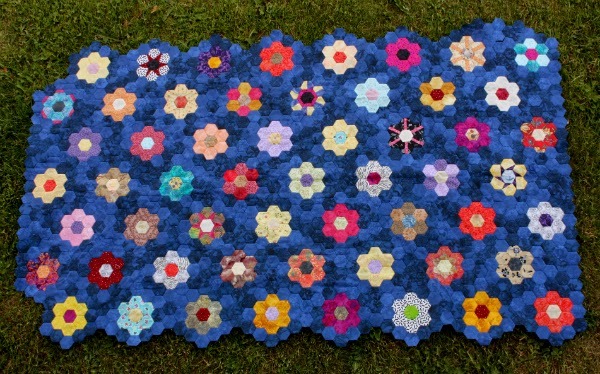 Your hexie flower quilt will be awesome. You mean you have many WIP too - most of us do - I know I'm guilty! Nice post. Happy Birthday! Love the hexies quilt. I really like to read John Scalzi in SF at the moment! That is awesome that you do a devotional! I love your hexies quilt! I hope you had a wonderful Birthday! What a fun way to celebrate! Nice to meet you! Happy Birthday for a few days ago :-) Your quilting is exquisite - your mini quilt in particular really pulled me in! Late visit on the blog hop! Beautiful quilts and your FMQ in particular looks amazing, the detail on your scrappy log cabins is just incredible. You must have a lot of patience. I love the sea too and we live near enough to go often, I can't imagine living far from the coast now either. Favourite books - I love reading and seem to have quite an eclectic mix these days. I frequently enjoy some of my teenager son's books - Jonathan Stroud's Bartimaeus trilogy was great recently. For grown up books, maybe Jasper Fforde - a bit strange but very clever! And I've just finished reading a Margery Allingham book which I really enjoyed. I could add lots more but they'd all be a strange mix! Hi Leanne - it's so nice to finally get to know a bit more about you (I say finally because I'm just not getting through the last bunch of blog hop sites!). What a lovely environment you live in and you have an adorable family. Your S&B mini is incredible! I would say, yes, you definitely have reached a level beyond beginner - looks more like advanced to me. :) With two small kids (almost 5 and almost 3), all I've managed to finish reading this summer was The Signature of All Things. Loved it! !